Just a quick post to say that I recently discovered a brilliant scarf in Accessorize in a very rare shade of rose pink. All too often, the pinks you find in the shops are warm. Not this one. Bonus tip for all seasons: Match your lipstick to the scarf to amplify the effect. Even better if that colour is one of your very best! I have a rather embarrassing confession to make. As a self-confessed colour junkie, and as someone who might be mistaken for an expert, I recently invested £40 in an eyeshadow palette that didn’t work for me. By that I mean, the colours didn’t quite work on my skin. Bit embarrassing, that. We live, we learn. I know I’m always learning. This purchase resulted in much head-scratching. It wasn’t so much that I had ‘wasted’ £40 on something that didn’t work for me (as it happens, the colours work beautifully on my Summer niece – something I’ll get to in a minute), it was more my confusion at having got it wrong. My problem-solving brain needed to know why those colours didn’t work. I had to know. Makeup is hard to buy, especially if you’re a perfectionist. If you’ve just had your colours done and you’ve switched from, say, Autumn makeup to Summer makeup (and you are indeed a Summer) then you will likely see a marked improvement. 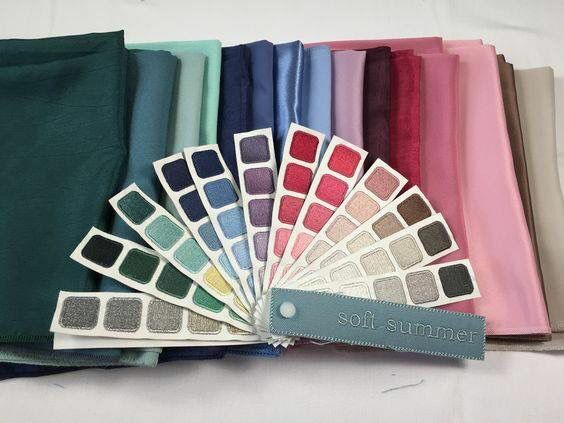 When you’ve lived with your colour palette for eight years, buying what might be considered Soft Summer makeup when you are almost certainly a True Summer just isn’t satisfying. The reality is, I need the cool colours in my palette but I had somehow decided that the slight increase in warmth would bring out the blues in my eye. I was wrong. The bareMinerals ‘cool-neutral’ colours looked like bruises on my face. I am a Summer, a Deep Summer in the House of Colour system. Cool, deep, soft colours suit me. The bareMineral bare sensuals palette is indeed a cool-neutral palette. I figured some colours would be warmer than others, but that most would work for me. I am aware that some colours can look deceptively warm when they actually have cool undertones. So, who is this eyeshadow palette for? I’m now reasonably confident in saying that this palette would work for Soft Summers, and probably Brown Summers in the House of Colour system. It could also work for Summers who aren’t as cool as I am. I say this with reasonable confidence as my niece is one such person. She was draped with House of Colour several years ago, and came out as a Summer who suited the mid-Summer colours; that is, not the darkest shades and not the lightest, but those that sit in the middle. I sit on the Summer/Winter border and so it makes sense that I am cooler than her. The cooler colours in the bareMinerals palette (the pinks, purples and silvers) look amazing on her. I wish I had photographic evidence. When the shades of purple from the palette were applied, I knew we’d hit her personal colour sweet spot. Her eyes looked so crisp and in focus. She became magnetic to look at – I couldn’t take my eyes off her. Her reaction, perhaps most tellingly, was brilliant. When she looked at herself in the mirror, she literally did a double-take. Interestingly, the warmer pinks and bronzes in the palette were just a touch too warm for her – perhaps they’d work for a Brown Summer? You could argue, quite reasonably, that they look a touch warm. With all this in mind, I started to think about Brown Summers (in the House of Colour system) in relation to Soft Summers (in the Sci/Art system as favoured by Christine of 12 Blueprints). Would my niece fall into the Soft Summer category? Perhaps; this could be an avenue worth exploring. Or perhaps she’s simply just a touch warmer than me. Is she a Brown Summer in the House of Colour system? I don’t think so, but I wouldn’t like to put money on it. Okay, so, I want to enhance my grey-blue eye colour and my skin, so what is it I’m looking for, then? My niece has what I’d describe as mostly green eyes, and green sits roughly opposite purple on the colour wheel. This may well explain why the purple shades brought out the colour of her eyes so much (colours that are opposite each other on the colour wheel – complementary colours – make each other look brighter). 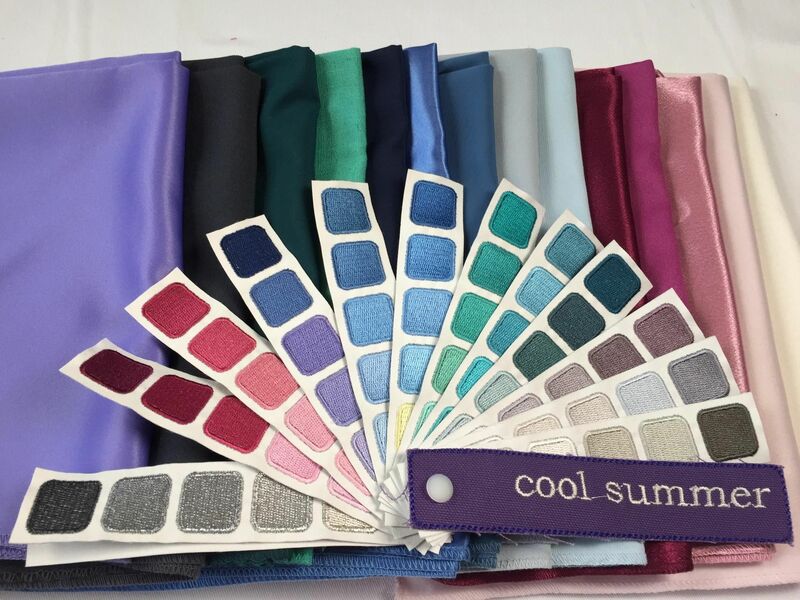 Seeing the True Summer eyeshadow palette, I was immediately reminded of my Cool (True) Summer fan. Whilst I’ve never been officially draped by someone trained in the Sci/Art system, I have long since suspected that I would fall into the Cool (True) Summer category. I do believe that, when it comes to makeup, we have the least room for error here. These colours are literally on our face, on our skin; any mismatch soon becomes obvious. Within the broader seasonal palettes, some makeup colours might not work; I watched my Autumn friend some years back try out a variety of Autumn lipsticks at House of Colour. Some of those were simply not worth purchasing (she ended up going for a stunning brick red). Buying makeup is made harder by the fact that the colours can look completely different in the palette vs on the skin. Also, makeup is as much at the mercy of fashion as clothing is, which is to say that it is often difficult to find certain colours if they are not ‘in vogue’. Warm colours have been in shops and on makeup counters for a long time – my Autumn friend never seems to struggle when it comes to buying clothes, and I am seeing so many ‘naked’ palettes at the moment which essentially consist of warm-neutral and cool-neutral colours, presumably in a bid to ‘suit everyone’ for maximum sales. But here’s the moral of this story: not everyone is neutral. Far from it. For reasons I don’t understand, I drape more Summers on the Summer/Winter border than any other season. These are Summers just like me – very cool undertones, but colouring that is too soft to be Winter. People with this colouring (and indeed Winters) are not served by these neutral colours. Neutral is not synonymous with universal. We don’t all have neutral colouring. Swatch makeup on a tissue or white paper so you can compare the colour against your swatches. Colours on an eyeshadow palette / in a tube can look wildly different once applied to paper or your skin. Don’t shop by eye or hair colour. That lipstick that ‘works for every blonde’ is very likely not a match for your undertone. Take someone with you, preferably someone with some colour knowledge. Sometimes we become almost colour blind. Sometimes we are so determined to buy a burgundy lipstick that we can’t see that we’ve accidentally drifted into Winter when we are in fact a Summer (not speaking from bitter experience, honest 😉 – if you’d like to see another of my makeup purchase disasters, comment below). Take photos. It’s remarkable just how clarifying they can be. You see yourself in a more objective way in a photo. If you know your season, check out the 12 Blueprints Store to see what your colours look like in makeup. Swatch makeup products on the inside of your arm. Does both the colour and your skin look better? Try before you buy. Have the MUA at the counter apply the product so you can wear it for several hours before you return and (maybe) purchase it. Look at the product on your skin in different lighting (outside, store lighting, at home, etc). You might not be at the point where you want a colour analysis session, but you have an interest in colour analysis. If you don’t know your season, what can you do? Here are six things you can try. Most people wear black mascara, and most people don’t look good in it. Try switching to navy or brown. When I say navy I don’t mean the electric blue mascara of the ’80s. Nope! Try the No7 Intense Volume navy mascara. Navy suits Winters, Summers and Springs. If you try it and don’t love it, try brown instead, which works for Springs, Autumns and the cool-neutral Summers. When I say brown I mean a proper brown, (not brown/black, which works best for Dark Winters and Dark Autumns). If, when you apply your new mascara, you suddenly notice your eyes and not your eye makeup, you know you’re on the right track. I was astounded at how much of a difference it made to my face when I switched my black mascara to navy. True red suits everyone. No, really! Most people who come to me for a colour analysis session seem intimidated by red, and I do understand why. There’s no ignoring it. Absolutely everyone looks amazing in it though (I’m really not exaggerating), especially when they’re wearing true red and have on a matching true red lippy. Buy an inexpensive true red scarf if you’re nervous, and whilst wearing it try a matching lippy when you’re next near a make-up counter. And, if you do that, send me a photo! I’d love to see how amazing you look. True red is my favourite colour because everyone looks good in it. Why does true red suit everyone? Because it doesn’t contain blue or yellow, the two colours that, when added to a colour, change its temperature. Kettlewell Colours call it ‘Mallard’. Buying a scarf in this colour would be a cheap way of trying it out. You can’t go wrong with teal. If you fancy being a bit daring, try a teal eyeliner (and report back ;-))! I know it’s hard, I do. Black is everywhere. Having said that, navy is almost as easy to get hold of. Swapping black for navy will be a dramatic improvement for the vast majority of people. If you don’t love your natural hair colour then you’re wearing the wrong colours. Even the most ‘mousy’ of hair will look beautiful when you’re getting your colours right. If you’ve dyed your hair, notice how it makes your face look. Does the jet black hair make you look pale and washed out? Do you look a bit sickly in a warm, brassy blonde? Is it time to consider dying it back to your natural colour? Once you know your season, you can afford to be bold. This one might surprise you, but here’s the thing: often, when people show up to a colour analysis session they say to me ‘Please don’t tell me I can’t wear X’. With the exception of black (which people generally love because it’s easy and considered sophisticated), when someone turns up with a favourite colour that they don’t want to be parted from, it ends up being in their palette, and one of their best colours, too. Our instincts are surprisingly good. Trying to figure out whether you have cool or warm undertones from your foundation is almost certainly doomed to fail. Reading into your jewellery colour preference is too risky. I know plenty of Winters who love gold jewellery, and even more women who are wearing the wrong foundation colour. I’ve been a fan of Marian Keyes for the longest time, since the days of Watermelon and Lucy Sullivan is Getting Married. I recently read her latest book, The Break, and was struck by the main character Amy’s love of fashion. Throughout the book, references were made to the kinds of makeup and clothes that the character felt suited her (very consistent with someone who was a Winter, I couldn’t help but notice) and there was even a reference to colour analysis. This was the interview I watched. Take a look at her house, too, and Marian’s top. The dark hair really suits her, and those eyes! The remarkable pale grey/blue/green of a Bright Winter. I suspect the interviewer (Sam Baker) is an Autumn. She’s much more muted than Marian, and her hair looks to be a muted russet. I bet she’d look great in an antique teal or a dark olive (I always get such Autumn envy whenever I think about the palette). Having done a bit of Instagram stalking, I am convinced Marian is a Romantic of some description. She loves her fabulous shoes and her animal prints; there’s a brilliant pic of her in a leopard print dress (all Winter colours). I enjoyed the book all the more for its references to colour and fashion. I wasn’t at all surprised to discover that both Marian and her character Amy were Winters. A couple of years ago I wrote a blog post about my skincare routine, after having successfully managed to rid myself of acne which had plagued me since I came off the pill. The downside to having perfected your skincare routine, I have come to learn, is that when one or more products are discontinued, it means you have to embark on another epic mission to find replacements. I had spent two years finding the perfect balance of products for my skin, so the task felt daunting. Garnier changed the formula and packaging of their PureActive toner. It doesn’t seem to suit my skin as well; last time I tried it, it was a bit harsh and drying (I’ll likely revisit it at a later date). bareMinerals discontinued my beloved Active Cell Renewal serum, and I think this has caused me the most issues. Yesterday I popped onto their site and it seems that there are quite a few unhappy customers complaining that their latest batch of skincare products aren’t up to much. Many were complaining that the products were irritating their skin. I didn’t want to spend £40+ on a serum only to have it irritate my skin or show little improvement. Since I switched to a different toner and stopped using a serum, my skin just hadn’t been the same. Dry, and therefore more acne-prone than usual, I was seeing blemishes and patches of dry skin which I couldn’t get rid of with the La Roche Posay Effaclar Duo[+] moisturiser. I bought another moisturiser from LRP, a more nourishing one. I used both. My skin was still dry and looked awful under my foundation. I was starting to panic. I consulted my usual group of beauty gurus (I am lucky to have such a group!) and one suggested using jojoba oil as a moisturiser. I already had some, since I use jojoba and lavender for cleansing, so I figured I had nothing to lose. If you are struggling with dry skin, I highly recommend jojoba. After cleansing and toning, I rub some on my face and pat off the excess with a clean flannel. Thus far, it has worked wonders. My dry skin has gone, my fine lines have improved and my blemishes are vanishing fast. My skin glows in a pleasingly healthy way and my foundation sits nicely on top of it, too. Jojoba won’t be discontinued, either. It’s a raw ingredient, as it were, so it’s sold by a wide variety of manufacturers. It’s early days, but I’m hopeful. I am honestly excited to wash my face and moisturise at the moment. I love how my skin looks afterwards. I’m definitely happy with this toner. It feels as though it’s doing its job, it’s not very expensive, it lasts AGES (I’m still on my first bottle, I ordered it nearly a year ago) and it leaves your skin feeling perfectly prepped for moisturisation. I’m a fan. I could definitely spend more money on jojoba oil, and perhaps I’ll try another (more expensive) version at some stage now that I’m using it as a moisturiser. I’ve been using this brand for years though, and it’s great. A 250ml bottle lasts me about 7-8 months. I’m still cleansing with jojoba and lavender oil. I am still in love with oil cleansing and have no desire to change this, it’s the part of my skincare routine I’m most confident of. I’ve only been using jojoba as a moisturiser for a few days, but so far so good. If this does work out then I’ll have cut my skincare costs dramatically. No more LRP moisturisers (at £12-15 each), no more serum (at £40+ each). I find this thrilling.